Ascending Butterfly: Sunday, January 03, 2010 - This Week's 'Moment of Gratitude' and THREE giveaways! Sunday, January 03, 2010 - This Week's 'Moment of Gratitude' and THREE giveaways! 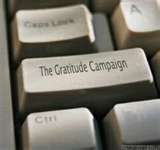 On Sunday's, 'Today's Moment of Inspiration' becomes the weekly 'Moment of Gratitude'. While I do still live in Gratitude each and everyday, I decided to change this feature to a weekly to allow a full week of Inspirational messages and focused breathing meditations. New Year/New Gratitude! Can't wait for all the new opportunities that 2010 will present to me to be grateful for! Ƹ̵̡Ӝ̵̨̄Ʒ - For being blessed with the health to usher in a New Year with the ones I love by my side! Casa de Butterfly was filled with gratitude to be able to ring in 2010 with hope, laughter, music and optimism! I hope you all had a safe New Years Eve, a happy New Year's Day and that each and every one of you are blessed with the best that 2010 has to offer! How did you ring in the New Year? What, if any, are your resolutions this year? Ƹ̵̡Ӝ̵̨̄Ʒ - I am grateful for Ascending Butterfly's wonderful sponsors who are helping to ring in this New Year with GREAT giveaways! What are you grateful for today? I'd love for you to write in and share what you are grateful for this week. The more you say it, the more you speak it, and the more you live in gratitude, the more you will find reasons to be grateful for. So join me on this journey of gratitude and inspiration. And you can post here daily (even though my list will be posted weekly). Don't forget to enter the great giveaways on the upper right hand side of the page! We will be offering multiple giveaways all throughout 2010! It's just our way of saying Thank You! for choosing to spend part of your day with us. We are really happy you landed HERE! NOTE: Readers have asked us to make entering the contests and giveaways, faster and easier. Your wish is our command! We have moved our 'Today's Butterfly - Featured Site(s) of the day, which is where we host our giveaways, to the upper right hand side of the page. It will be located here from now on to make entering the giveaways faster and easier. Keep the suggestions coming, remember we also have a NING group with real time chat, you can give us your comments and suggestions in REAL time, how cool is that? NOTE 2: Twitter followers: please remember you must also follow Ascending Butterfly using Google friends connect on the upper right hand side of the page for your entries to be processed. And remember if your profile does not have an email and you don't leave your email in your entry, we will have no way of informing you if you win, and we will have to select another winner. Make sure your entry or your profile have your email address! I am grateful every day that I wake up to have another day to see my beautiful family. I am grateful that I have good health (afew normal age-related glitches) and I am ever grateful for knowing God loves me inspite of my imperfections, and I am so grateful for my wonderful adult children and their children! They make my heart sing! I'm so grateful that God allowed me to get up this morning in my right mind. I'm grateful that the angel of death didn't come upon me nor my family/friends. I'm grateful for my family and there love...I'm grateful for the hard times i have endure for they have made me stronger. i'm grateful for all my new/old twitter friends. Again...that you for this wonderful post! Have a Bless Day! This Week's 'Moment of Gratitude' and THREE giveaways! Winner Announcement - 2 Giveaways, 6 Winners! I'm not just a butterfy, I'm an Angel too!